I generated it from indeed.com, you can see the live up-to-date information using this link. 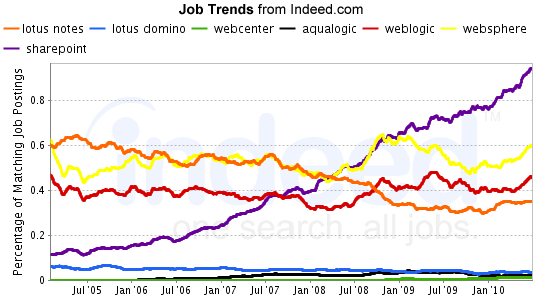 As you can see, the growth of SharePoint related jobs in the past 5 years has skyrocketed. Meanwhile, technologies such as Lotus Notes and Domino, Oracle WebCenter, IBM WebSphere and others have declined or stayed about the same. This is an obvious indication that businesses see the value in SharePoint and are deploying it in their organizations. The curve upward in the 2007 time frame tells me that MOSS 2007 was a huge decision driver, with its wide feature set. I believe weâ€™ll see another push upward during this year as SharePoint 2010 expands on features and enriches ones already present in the former version. Self-service Business Intelligence gives end users (rather than IT) all the power in performing analysis to gain insight into their business. Microsoft is leveraging SharePoint and Excel, tools that users are very familiar with, to deliver. I think this will continue to grow, as people donâ€™t want to depend on a business analysts or someone else in IT to build cubes, charts, slicers and analyze their data. BPM stands for Business Process Management. There are vendors that focus specifically on BPM. I think Microsoft is weak in this area right now but I see them trotting along to provide their perspective on how BPM should be done. BPM uses a combination of technologies to automate business processes. Some are machine-specific (like workflows) while other actions require user interaction (forms, for example). SharePoint is Microsoftâ€™s â€œhumanâ€ component for BPM and for now they have decided to leverage partners (3rd party vendors) for the machine-specific actions. Watch out for more coming in the next 2-3 years on BPM. In conclusion, if youâ€™re looking for a job, a way to become more valuable on the market or just expand your skillset, SharePoint is an excellent choice of technology. From the chart, you can see its not going anywhere, anytime soon. 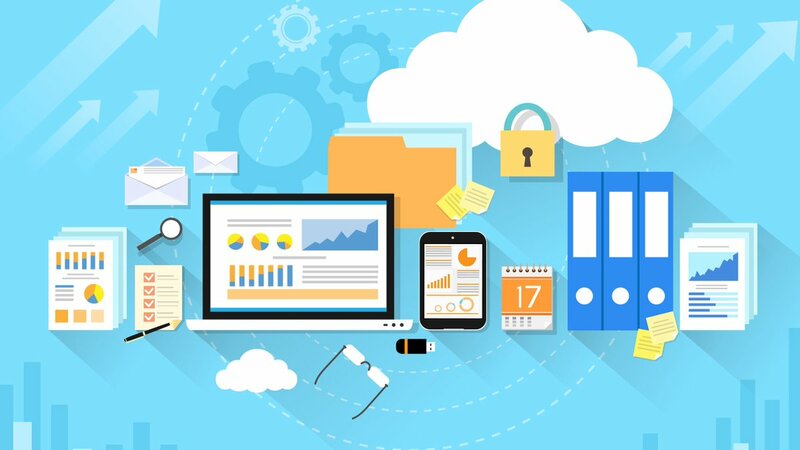 There are upcoming trends like cloud computing, self-service BI, and BPM. Since Microsoft leverages SharePoint for all of those, it definitely wonâ€™t be a waste of time either.